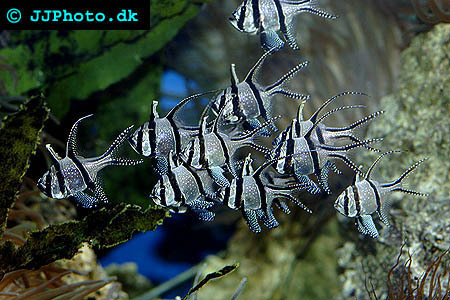 Company: Pterapogon kauderni (Banggai cardinal fish) is suitable in a reef tank. Aquarium Setup: Pterapogon kauderni (Banggai cardinal fish) must be given a dark shelter to hide under during the day. They are nocturnal bottomfeeders by nature. Banggai cardinal fish appricieates low temperatures, but 72-78 degrees F. is not a problem. Keep levels of ammonia, nitrite and nitrate as close to zero as possible, even though Banggai cardinal fish usually can edure a few tens of ppm of nitrate. Brisk filtration is usually necessary. Food: Pterapogon kauderni (Banggai cardinal fish) eats benth crustaceans, zoobenthos, small fish and mobile invertebrates. In aquariums, they will happily eat shrimp, small fishes and other fresh and frozen meaty foods. You can also train your Banggai cardinal fish to eat frozen processed foods. Dry prepared foods, such as pellets and flakes, will not be able to sustain a Pterapogon kauderni (Banggai cardinal fish). 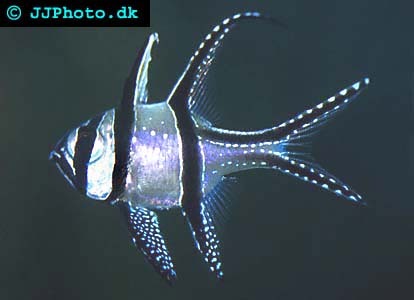 Breeding: We have no information about how to breed Pterapogon kauderni (Banggai cardinal fish) in aquariums.